How much does a typical 2,000 SF home in Park Slope (Brooklyn) cost? Homequant configures. How much does a typical 2,000 SF home in DC West (Zip 20016) cost? Homequant configures. How much does a typical 2,000 SF home in Newport Beach, CA cost? Homequant configures. How much does a typical 2,500 SF home in Garden City (LI) cost? Homequant configures. Is LA Housing Market More Affordable than Brooklyn, Chicago and Philadelphia Markets? What is the Location Value of Brooklyn Heights, NY? LocValu demonstrates. What is the Location Value of Miami Beach, FL? LocValu demonstrates. As the model gets further fine-tuned (not shown here), the r-squared tends to approach .90, COD/COV falling below 10, at which point it can be applied on to dated mortgage portfolios / prior assessment rolls in order to have them re-priced / re-assessed in line with the market. Home Buyers MUST Validate Home Values at Self-directed Sites. Home Buyers MUST Verify Appraisers' Values in Four Easy Steps. The final five are producing the subject valuation. While the Median Adjusted Sale Price (ASP) is the most probable value for this subject, 25th to 75th Percentile range is the most probable range. Alternatively, an investor may consider up to the 25th Percentile, while someone bent on outbidding the competition to acquire the property could start above the 75th Percentile. It is therefore quite relative. Home Buyers MUST Use Five Best Comps to Value a Subject. In this example, the subject (a single family home) is located in Orlando, with the following attributes: 15 year old and 1,500 SF of bldg area on a 6,000 SF lot. Three Sales from Three Prior Quarters - Unadjusted for Time of Sale - are NOT Comps. Three Sales from three prior quarters - unadjusted for time - are not comparable sales ("comps"). They must be adjusted for the time of sale. Home Buyers MUST Choose Least Adjustment over Distance or Sales Recency. Of the three methods to evaluate comparable sales ("comps") - distance radius, sales recency and least adjustment - least adjustment is the most powerful method. Since most comps are pooled from a limited distance within the same neighborhood and older sales are generally time adjusted, distance and sales recency become less powerful methods than least adjustment which, in addition to sales time adjustment, incorporates adjustments for property features as well. Note - while determining least adjustment, signs are ignored. Therefore, +3,000 and -3,000 are tied. In the table above, +2,940 is a smaller number than -8,510, hence being considered the best comp here requiring the least adjustment. Home Buyers MUST Learn to Differentiate between Sales and Comparable Sales. A list of sales - by default - does not become comparable sales ("comps"). Sales - even from the same neighborhood - must be quantitatively adjusted for characteristics and time to become comps. Once adjusted, the differences in property characteristics, distance and time (9/2014 and 9/2015 sales are not the same) become irrelevant. Home Buyers MUST Demand to See the Comparable Sales, Spatially. Remember: Comparable Sales ("comps") from the other side of a major artery can be significantly pricier, thus improperly inflating the value of your subject property. So, demand to see the comps - contributing to the valuation of the subject property - Spatially! The same idea is equally applicable for the existing homeowners planning to challenge their property tax assessment. Ask your Tax Assessor to show the comps (that contributed to your assessed value) on the map. 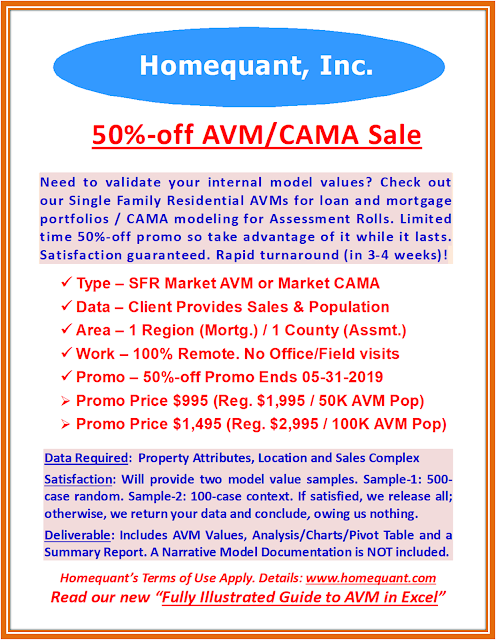 Since Assessors (of larger jurisdictions) heavily depend on Automated Valuation Models (AVM), this is often a serious problem. If you see the comps on the map, you can relate to them more meaningfully. In the graphic below, any comps from south of Hwy-417 might be inappropriate! The LocValu (URL http://locvalu.com/) invention offers market-derived fixed location values for the major markets to help consumers understand the relative differences in values brought about by virtue of variations in location alone. Currently, LocValu’s fixed locations represent Zip Codes within a market area, though the developer is planning on adding Census Tracts, shortly, as an alternative value node. Since the LocValu portal provides a generic solution, it will be extremely useful for individuals and businesses alike. Here is how the LocValu portal will help consumers: If Zip Code X shows a median location value of 2.56 while a contiguous Zip Code Y carries 1.32, a potential homeowner would instantly know that the location value alone could make comparable homes in X significantly pricier than those in Y. Likewise, a potential storefront renter is expected to pay a much higher rent in X than in Y, while a multi-family developer would be willing to pay a higher price for a comparable parcel of land in X than in Y – all owing to the higher value of location alone. Since these Zip Codes have been assigned statistically significant and market-adjusted location values, consumers will more comfortably accept them as their "mutual" choice of price differentials than the heuristic or opinion-based counterparts without a scientific base. In terms of the potential use by consumers, the possibilities are numerous. Homebuyers can re-price comps (without having to recollect new comps from the other Zip Codes of interest); tenants can re-price rents; apartment, office and retail management companies can readjust rents; home developers can market-adjust prices; reo-to-rental companies can verify portfolio prices; loan officers can (apply these location values to generic costs) to develop “first look” values; hospitality chains can validate room rents; insurances can verify rates, to name a few. Once a user selects a market from the home page (Graphic One above), the map of the market appears, with Zip Codes highlighted in Red. By clicking on a Zip Code user can see its median location value. A range is also provided to highlight the level of diversity within the Zip Code. Contiguous or a set of Zip Code values may be viewed by opening them up simultaneously (Graphic Two below). Alternatively, a specific Zip Code value may be sought via the Zip Code box provided. In order to view the color-coded heat map (Graphic Three below), the Zip Code boundaries must be turned on. The navigation mechanism, however, remains the same with or without the boundaries being on. A 3D surface chart (Graphic Four below) is also provided to offer a consolidated view of the entire market, elegantly displaying the locations of the peaks, troughs, plateaus and everything in between. 1. Individuals – they can use LocValu in many different ways: from validating comparable home sale prices across Zip Codes to verifying consumer price differentials (e.g., restaurants to beauty salons to movie theaters to daycare, etc.) due to location differences, etc..
2. Retail businesses – while evaluating comparable retail business locations across Zip Codes, prospective renters can use LocValu to understand the true differences in market rents due exclusively to the differences in location. Likewise, landlords can use it to test the existing and set the future rent. 3. Apartment complexes – apartment management companies can effectively utilize LocValu to validate internal rent levels for similar complexes located in different Zip Codes. Since LocValu is an independent source, their rent variations might be easier to justify. 4. Banks and Mortgages – loan officers and mortgage underwriters in local banks and mortgage companies can use LocValu to develop market-adjusted cost approach values by applying these location factors to readily available cost factors. 5. Insurance companies – while developing the risk scores actuarial scientists can use these location values as control parameters. In a nutshell, the LocValu system offers a very uniform – and statistically significant – invention that provides a generic solution to the long-standing problem of valuing fixed locations, in clear contrast to the traditional opinion-based valuations without any scientific basis.